Magneti Marelli is going through a further important growth in China with the inauguration of two production sites in the field of lighting and electronic systems, in two key regions for the Chinese automotive scenario - Xiaogan e Guangzhou. The actual total investment is worth about 36 million Euros. Today, April 15th a manufacturing plant was inaugurated in Xiaogan (Hubei province), born of the Joint Venture called Hubei Huazhong Magneti Marelli Automotive Lighting Co. Ltd. . 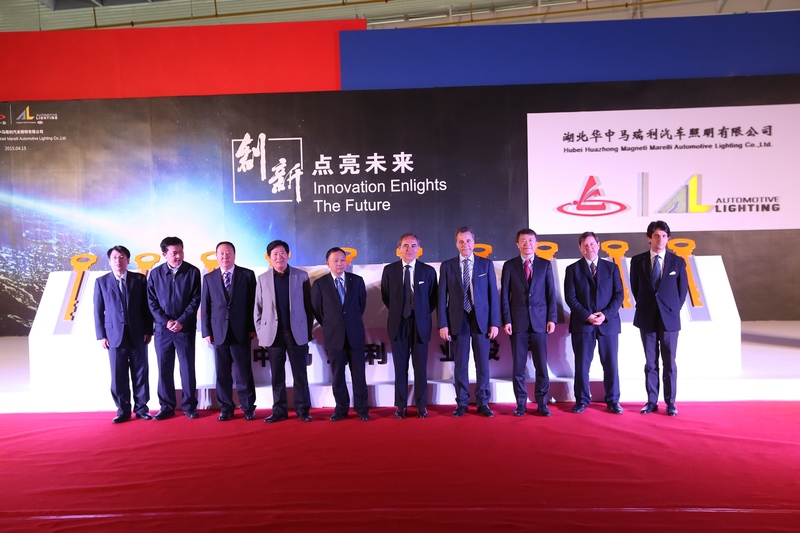 The JV resulted from the partnership between Magneti Marelli and China South Industries Group Corporation (CSI), through the subsidiary Hubei Huazhong Photoelectric Science and Technology Ltd, aimed at the manufacturing of lighting systems for the automotive sector. CSI is one of the most important Chinese industrial groups (with a yearly turnover of over 55 billion Euros), with a vast perimeter of assets – from cars to motorbikes, from defence to energy – and which includes also China Changan Automotive Group (CCAG) – a strategic partner of some among the most important JVs in the Chinese automotive market (Ford, Mazda, Suzuki, PSA), and the fourth most important Chinese manufacturer. The surface of the industrial plant in Xiaogan is of more than 44 thousand square meters, 28 thousand of which are covered. Inside the plant an important R&D centre has been created (of about 4 thousand square meters): it is highly structured in order to work in close contact with the car makers present in the area. The capacity of Magneti Marelli Automotive Lighting to design, develop and produce locally hi-tech products with a high added value, accordingly to the needs of the Chinese market and carmakers, is strategically increased with CSI. In the start-up phases, the plant may count on a staff of over 160 people in 2015, with the expectation of a progressive people increase over the next five years. The initial manufacturing capacity shall be of 500 thousand headlamps (made initially for the Ford Taurus in the halogen version and the Full-LED version with E-light adaptive system – a world first) to achieve 2.5 million headlamps and 2.5 million rearlamps in 2019. The initial total investment for the plant is worth 14 million Euros, with a plan of nearly tripling the investments in the next five years, in order to enable a growth according to market requirements. “With these two new facilities, we keep on expading our presence in China, which for Magneti Marelli is becoming more and more important” stated Eugenio Razelli, CEO of Magneti Marelli. “We accelerated this process in the last five years, following the Chinese market growth and the consequent needs of our clients. And that’s the key element of Xiaogan plant opening for the lighting business and the Guangzhou plant enlargement for electronics: bringing and localizing in China the capability to design, develop and produce locally key products and automotive technologies, accordingly to the needs of the Chinese market and key- carmakers”. The new Magneti Marelli Automotive Lighting plant in Xiaogan will complement the one inaugurated in 2013 in Foshan and the structures already existing in Wuhu and Shanghai (Headquarters and Research Centre). The goal is to achieve, in the medium term, a 10% market share, progressively enlarging the industrial presence in all the strategic areas for the automotive sector in China. Recently, Magneti Marelli Automotive Lighting has been awarded two Red Dot Awards 2015, one of the most prestigious international recognitions in the field of design and industry: in particular, the first award has been conferred to the intelligent Full LED headlamp, developed with Audi for the Audi TT3, MY 2015 – award “Red Dot Best of the Best” – for the high quality of the design and the innovative project; the second award has been assigned to the prototype of rear light with OLED (organic LED) technology – “Red Dot” award – for the quality of the design. Moreover, tomorrow April 16th, the enlarged Magneti Marelli Electronics Systems plant in Guangzhou - Guangdong province – will be inaugurated, with a total investment of 22 million Euros. The plant is strategically located in the close neighbour of the Guangzhou airport and close to the automotive and electronics plants of the Huadu district. The total surface of the industrial installation is of 50 thousand square metres (41 thousand of which are covered) and includes an R&D centre of 3,500 square metres. Presently 650 people work in the plant, with a plan of almost doubling the number by 2019. The current manufacturing capacity is of 3.5 million automotive electronic modules, which will reach 10 million in 2019. The enlargement has been made necessary by the progressive growth of the Chinese car market, with a consequent need of enlarging the products portfolio and increasing at the same time the capability of research, development and design, aimed at improving competitiveness. The main clients – local and global - are CAPSA, DPCA, PSA, FAW-VW (First Automotive Works- Volkswagen Auto Co., Ltd.), Geely, GAC (Guangzhou Automotive Co), GAC-FIAT, SGMW (Shanghai GM Wuling), Qoros Automotive Co., Ltd., SAIC Motor and SVW (Shanghai Volkswagen), Suzuki, SGM e BYD. The best technologies in terms of Automotive Lighting and of Electronic Systems will be the protagonists at the Auto Shanghai trade fair from April 22nd to April 29th. Magneti Marelli has been active in the Country since 1996 with manufacturing plants and R&D/Engineering Centres in Shanghai (Magneti Marelli China Headquarters, R&D Automotive Lighting, Powertrain in JV with Shanghai Automobile Gear Works - SAGW - and Exhaust Systems), Foshan (Automotive Lighting), Wuhu (Automotive Lighting and Powertrain), Guangzhou (Electronic Systems), Hangzhou (Shock Absorbers in JV with Wanxiang Qianchao Company), Changsha (exhaust systems with Fiat/GAC), Changchun (Powertrain in JV with FUDI) and in Hefei (exhaust systems with JAC and Lingdatang). On April 15th, the new Automotive Lighting plant has been inaugurated in Xiaogan (a JV with CSI).